The Reishi mushroom (Ganoderma lucidum), an edible type of medicinal fungus that has been used for various healing abilities for thousands of years, is a true “superfood.” Also known as Ling Zhi in Chinese, these mushrooms are strongly anti-inflammatory, increased longevity, better immune function and mental clarity. Everybody knows Reishi mushroom well from social media and advertisement that it has benefits but less people don’t know how Reishi mushroom has more benefits. Today we will introduce the benefits of Reishi mushroom. The scientist found that this Chinese medicinal mushrooms can help protecting the cancer and fight with cancer. Help improving the function of liver and preventing the liver disease. The researcher found that the Reishi mushroom can have highly therapeutic effects on neurodegenerative disorders such as Alzheimer’s and Huntington’s disease that have 3 abnormality symptom is Movement Disorder, Schizopheria and Dementia. Reishi is a popular choice in tea blends for patients who wish to lower their blood pressure. It says that Reishi is effective for lowering cholesterol, preventing blood clots and stabilizing blood pressure. Because in Reishi mushroom has protein that called Polysaccharides which help to restrain the Synovial fibroblasts that cause Rheumatoid arthritis. Controlled the level of sugar in blood and heal up the diabetic ulcer in the diabetes patients. Especially the allergy form any reason that a lot of people got this disease. Because in Reishi mushroom has the benefits for anti-free radical and defend against DNA destruction so it’s can help to anti-aging and skin. Decrease the anti-free radical inside cells, whatever in body, It will be eliminated. Reishi mushroom is considered as an immune modulator as it regulates and supports the immune system. The Memorial Sloan-Kettering Cancer Center recommends use Reishi mushrooms because they contain proven immunostimulant polysaccharides such as beta glucans. Now we see the benefits of Reishi mushrooms like recover, protect and maintain. However, it has bitter taste but in the past people said “Sweet is faint, Bitter is medicine”. For longevity and healthy life, Do not miss Reishi mushroom from a list of things that work for you to stay healthy because it’s well-known in longevity. If you are interested in “100% authentic Chiang Dao Nature Food” , you can call or ask for rental information to buy products at the factory. 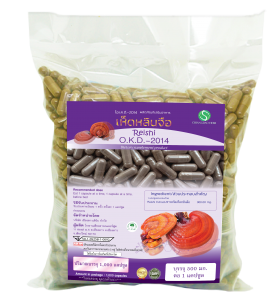 This entry was posted in Thai herb and tagged Lingzhi Mushroom, Reishi mushroom. Bookmark the permalink. ← If your body is fatigue, Chong Cao can help you.